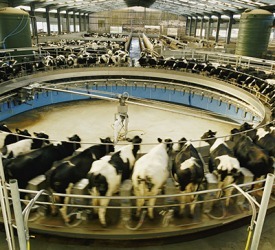 Dairy cows move on a rotation platform called a rotary milking parlor while getting fed, washed, and milked. Rotation is the process or act of turning or circling around something. An example of rotation is the earth's orbit around the sun. An example of rotation is a group of people holding hands in a circle and walking in the same direction. "rotation." YourDictionary, n.d. Web. 25 April 2019. <https://www.yourdictionary.com/Rotation>. Mathematics A transformation of a coordinate system in which the new axes have a specified angular displacement from their original position while the origin remains fixed. Regular and uniform variation in a sequence or series: a rotation of personnel; crop rotation. The motion of an object around an internal axis. A single complete cycle of such motion. A transformation of a coordinate system in which the new axes have a specified angular displacement from their original position while the origin remains fixed. The earth's rotation about its axis is responsible for its being slightly oblate rather than a sphere. (mathematics) An isometry that fixes precisely one point. From Latin rotationem, accusative of rotatio. The rotation of the earth thus fixes the directions of north and south and defines those of east and west. The cups are placed symmetrically on the end of the arms, and it is easy to see that the wind always has the hollow of one cup presented to it; the back of the cup on the opposite end of the cross also faces the wind, but the pressure on it is naturally less, and hence a continual rotation is produced; each cup in turn as it comes round providing the necessary force. Such rotation can obviously be controlled within limits that need not be further considered. Under hay are included the produce of clover, sainfoin and rotation grasses, and also that of permanent meadow.